OUR MISSION IS TO PROVIDE YOU WITH THE MOST COMPREHENSIVE EYE EXAM, BECAUSE YOU ARE WORTH IT. Dr. Jeffrey L. Morrill & Associates is the leading optometry group practice in Southeastern Massachusetts—a feat that couldn't have been accomplished without the thousands of satisfied patients we've helped over the years. We've built our reputation for excellence by focusing on building relationships with our patients that last a lifetime. Dr. Morrill and his associates don't just examine your vision—we work with you to develop vision plans that serve your needs for years to come. It's a difference in service that puts us in a different category than your typical chain store optometry office. 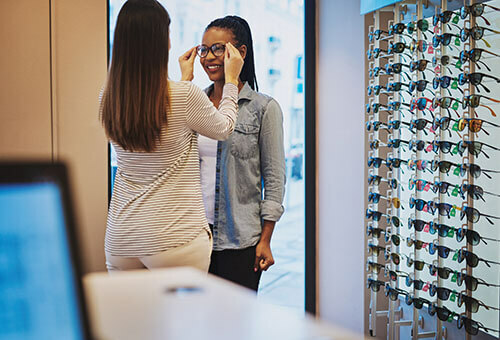 Whether it's new glasses, a specific brand of contact lens, new frames or a more unique solution altogether, we put your vision and your comfort first. From routine eye exams to LASIK surgery prep and recovery, we offer virtually every service you could need to maintain healthy vision for life right here in our office. If you're looking to save money we can help! If you purchase an annual supply of contacts lenses you will save time and money. Many of our suppliers offer us rebates and then we are able to pass the savings on to our loyal patients. You never have to worry about a shipping and handling fee. The lenses are shipped directly to you at no extra charge. Not sure what to get that special someone? Our gift certificates make the perfect gift! Dr. Jeffrey L. Morrill & Associates is your all-in-one local eye care solution for better vision and long-term eye health. With the most technologically advanced procedures at the disposal of our highly-skilled staff, you can rest easy knowing you’re getting the most complete vision care possible right here in Franklin!